Pro Neutra 5 is a highly alkaline compound which neutralizes acid water in potable water systems. This helps eliminate corrosion from piping, pressure tanks, water heaters and fixtures. A Neutra 5 solution injected into a water system will neutralize acid water and prevent corrosion. If you experience injector point clogging switch to Neutra 7. Available in 40 (SA40L) lb size. Acid Water Neutralization: The feed rate depends on the acidity of water. Proper dosage is reached when the pH of the treated water is between 7.0 and 8.0. Follow procedure for injecting soda ash as recommended by the chemical feed pump manufacturer or supplier. Tannin Water Softener Cleaning: Mix 1 cup of Neutra 5 with 1 quart of water and pour into salt storage tank on a weekly basis. Compatible with all major brands of chemical feed pumps. • Neutralizes acid water with a pH of less than 7.0. • Eliminates staining of plumbing fixtures and clothing. • Composed of NSF materials. 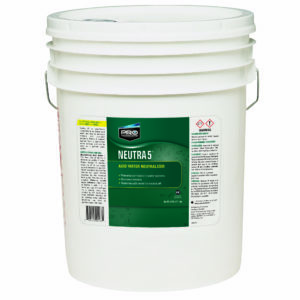 Pro Neutra 5 is a white granular powder and available as either lite or dense. sometimes get hot. Read relevant MSDS before handling product. • Do not mix with other chemicals. Please contact us to purchase this product or find out more information.